Materials: Worsted weight yarn of your choice, including contrasting scraps of yarn or thread for eyes and nose. Size F (3.75 mm) hook or size needed to produce a tight, stuffable fabric in single crochet. Polyester fiberfill or other stuffing material. Tapestry needle for joining, embroidery, and weaving ends. The bunnies are worked in spirals. Do not join rounds. Each increasing or decreasing round features 6 repeats of the increase or decrease stitch pattern. You may find it useful to mark the first stitch of each round. This pattern can be worked with any weight yarn and an appropriate hook…bigger yarn/hook will produce a bigger piece. As written, the finished bunny is 1.75 inches (4.5 cm) tall and has an earspan of 5.75 inches (14.6 cm). Working from top of head, ch 4, join with sl st to form ring. Round 1: 6 sc in ring: 6 sc. Do not join. Round 3: [2 sc in next sc, sc in next sc] around: 18 sc. Round 4: [2 sc in next sc, sc in next 2 sc] around: 24 sc. Round 11: [sc2tog over next 2 sc, sc in next 2 sc] around: 18 sc. Round 12: [sc2tog over next 2 sc, sc in next sc] around: 12 sc. Round 13: Sc2tog around: 6 sc. Round 14: Sl st as needed to close remaining gap and finish off. Weave in end. Sl st in 2nd ch from hook. Sl st in next ch, then sc in next 2 ch, hdc in next 2 ch, dc in next 2 ch, 10 tr in last ch. Working up the other side of the starting chain, dc in next 2 ch, hdc in next 2 ch, sc in next 2 ch, sl st in last 2 ch. Finish off, leaving a long end for sewing ear to the head. Weave in other end, or use it to help secure the ear as well. Bunny Headz! 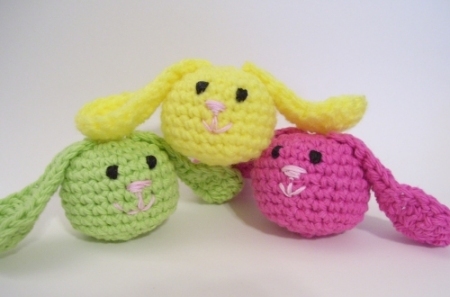 crochet pattern is Copyright 2008 by Deborah Ellis. Please do not reproduce this pattern in whole or in part. Please feel free, however, to sell any items that you make from this pattern. If you have any questions at all, please contact the author at neatlytangled@gmail.com. Thank you.